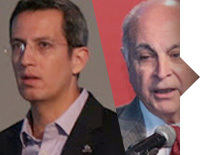 The Latin American and Caribbean community has reelected Oscar Messano and Oscar Robles the LACNIC Board, where they will serve a new three-year term. Messano was serving as president of the Board, while Robles was serving as vice president. Their new positions will be defined during the upcoming LACNIC Board meeting. Messano (Argentina) is an entrepreneur with more than thirty years of active participation in the field of telecommunications. He is president of eCom-Lac (the Latin American and Caribbean Federation for Internet and e-Commerce), vice president of CABASE (the Argentine Internet Chamber), and member of the board of the ISOC Argentina Chapter. Robles is currently General Director of NIC-Mexico, the organization responsible for the .MX country code top-level domain and Internet address resources for Mexico. He was one of the founders and has served as President of LACTLD, the Latin American and Caribbean Country Code Top Level Domain Organization, which groups major Latin American and Caribbean ccTLDs.